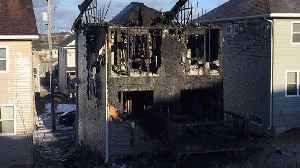 A fundraising effort for a Syrian-refugee couple who lost all seven of their children in a house fire on Tuesday in the eastern Canadian city of Halifax has raised C$339,042 ($257,357) from nearly 6,000 people in 24 hours, according to online fundraiser GoFundMe. A Spanish charity is working on drawing attention to the global refugee crisis by encouraging displaced Syrian &amp; Lebanese children to get together and play soccer. The US-backed Syrian Democratic Forces transferred more than 800 civilians, including families of Islamic State fighters, from Baghuz to al-Hol refugee camp on the outskirts of Hasakah, North Deir.. This Syrian family lost all 7 children in a tragic house fire after fleeing to Canada to escape the war. This video, "Canada House Fire Leaves 7 Barho Children Dead after Family Escaped Syria", first..